The Labyrinth is a walking meditation. Labyrinths have been found in many areas of the world and used by different religious traditions, and cultures. They have been known to man for over 4,000 years. The Self Discovery Wellness Arts Center Labyrinth is a grass replica of the one laid on the floor of Chartres Cathedral in about 1220. The labyrinth is a physical experience. Its rhythmic patterns turn you left to right and back and forth. Allow your body to be moved by the labyrinth. Breathe into the rhythm of your walking. The energy of the labyrinth is echoed in your own energy system. The blood circulating through your body, your finger prints, and the whirling pattern of your hair are all replicas of the labyrinth. 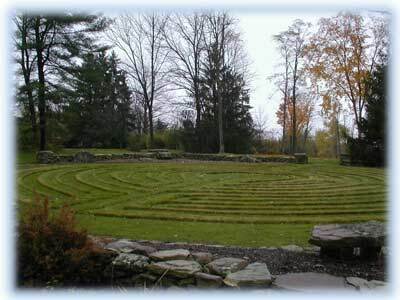 The labyrinth amplifies your own energy. Breathe the rhythm. The breath will bridge your meditation from physical body experiences to spiritual body experiences. Before entering the labyrinth you may want to focus on a situation, issue, or question of relevance to you. Simply coming to calm without setting any specific intention is also a way to begin. 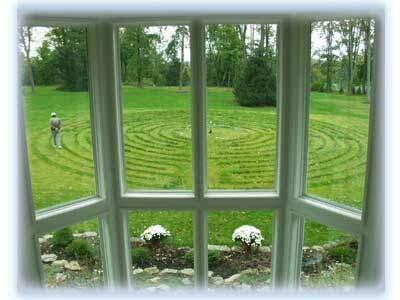 After leaving the labyrinth you may want to spend time in quiet reflection. Everyone's experience of the labyrinth is different. For some it may be immediate and/or emotional. Others may find that hours or days pass before the energy movesLabyrinth through them to a point of recognition. When we walk our labyrinth we walk with the trust that its energy is imprinted on us in the deepest levels of our being. The walking imparts a relaxed sense of balance and allows people greater access to clarity, inner knowledge, surrender, healing and spiritual attunement, according to each person's receptivity. Private walks may be arranged by request and group walks are scheduled periodically throughout the year.